So true Woodman. I'm repeating a quote I answered in another thread today concerning number of shipsets. "If you add completely new ship image families then ensure that the sequence of folder names retains a continuous series of numbers. For example if you add a new ship image family folder named “family26”, you must also have folders named “family25”, “family24”, “family23”, etc – all the way back to “family0”." Hope this helps! extended limits to DesignNamesIndex value in race files (new maximum is 50, not 13)"
Status: offline My mind is blown, anyone know when this happened? I remember trying and it not working some time ago and I always read patch notes. Somehow this new feature has flown past me. Now the real more important problem, I can't do these amazing ships that people create to add to my mod. I wish I could, would love to see my races have their own ships but unless I was to request ship sets from other people I cannot do it myself, not to a quality I would be happy to release anyway. This makes me want to revisit my BSG mod and add it to DWE. My mind is blown, anyone know when this happened? I remember trying and it not working some time ago and I always read patch notes. Somehow this new feature has flown past me. It's probable that some of the testing additions/fixes may get inadvertently omitted from the public patch notes that are put out after a new beta Haree....don't feel bad! I'm NOT condoning thievery....just a bit of 'redistribution' maybe! Status: offline Do it! It would make the mod more rounded, I'm going to have my first play with Extended this evening, looking forward to it. 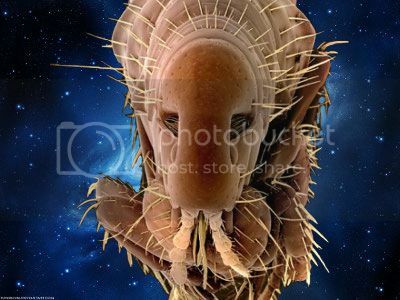 is that a picture of a water bear? Status: offline Haree; I am using your mod and I am enjoying it very much. I have added seven new shipsets, one for each new race, to give them more uniqueness. I am looking forward to the "unknown" when meeting these new aliens for the first time in my current game. Thank you! I recommend you update to this one, much better feel to the mod, and each race now flying in their own unique ships. Status: offline This mod is great! I am playing it now and it really enriches the gameplay and improves replayability. Adding nice new races to the game is always a good idea! Thank you very much, Haree! Really, looking forward to see you reaching game's 50 races limit! Lets inhabit this galaxy to the full! I will reveal more about the races soon but I just wanted to ask everyone how they felt about having minor races? By minor races I mean the AI will do not very will with them and their win conditions are harder to meet. This means 1 of your random or set races will be a bit of a pushover or alternatively be a challenge to play. How do people feel about that? Would you prefer that I change their background and personality just to balance them? Status: offline Haree, IMHO there are such in the original DW. Look at the Atuuk, for instance. Status: offline Yes definitely however in a way the AI can do OK with them. They make friends like crazy and breed like rabbits, so they spread like them. Also the win conditions for Atuuk are tailored to them so they potentially achieve them, they are easy win conditions. The races I am talking about don't have easy win conditions and are handicapped because of their personality. For example one of them are the Jintus, a rodent race mentioned in the Galactopedia. They have small man syndrome, they try to get alliances but also love to start fights but not actually fight them, they are little trouble makers. Their win conditions are based on this personality but the AI will always get himself in too deep when he plays them. I have seen the AI do alright with them but they would never actually win whereas in big games I have seen the Atuuk with the biggest lead before because of a good starting position. Status: offline Perhaps ye can make one new nation. I had this nation as sort of meanie in GalCiv2. 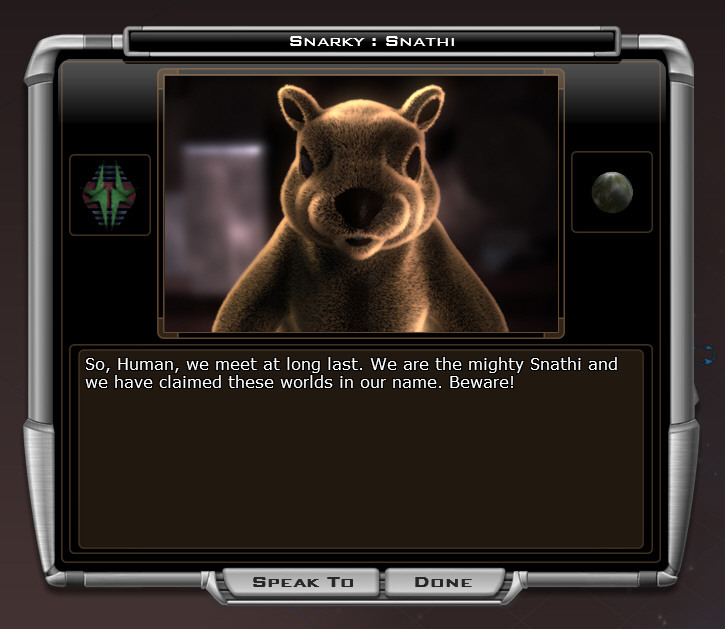 It was modeled after minor rodent race called Snathi and named Ûber Snathi. They are big mean space squirrels that have mentality of space pirates that want to take over the world. They breed like crazy, are furious ground fighters and have hyper squirrel powered industry to make big spaceships armed to the teeth to conquer all of the known universe. They may not be the brightest scientist and lack diplomatic finesse but they make it up by conquering and stealing tech from other races. It would probably be appropriate for them to have way of the darkness as starting gov as after all they were the last crazy attempt of the great dreadlords (the evil of galciv2) to get back at the universe. Government either Despotism or Way of the Darkness (after all they were created by the evil ones to destroy the galaxy). If WotD they should get -50 race science -> -20 science. P.S. For me at least it seems I have to re-enable this mod if the game manages to crash for some reason. Was having real weird issues like not able to talk to certain factions and/or pirates when I didn't notice the mod was not on. Status: offline I wont go against popular demand but I'm going to have to say I hated Galactic Civilizations attempts at comedy. I really don't want to inject a race in that is meant to be some kind of joke. If you crash it will lose your changes you made since starting the game, that's normal. Not being able to talk to pirates/factions? Do you mean you somehow had the new races of extended but the mod reported to not be on in the Theme Selection menu? Status: offline Current game was started with mod and new nations are there but when the mod was not on (as I didn't know crashing resets you back to vanilla) game just crashed when I tried to talk to modded pirates/nations. Status: offline That really shouldn't be happening. Have you modified my mod at all? What version of Distant Worlds Legends are you running? Status: offline I think you are not exactly understanding what I mean so let me put it in separate phrases. - I started game with extended activated. All races/pirates work fine. And no I didn't do anything to the mod. Status: offline I can only suggest it is a game version issue or you have a messed up install. Status: offline Haree78 - Since your races are so incredibly well-done and well balanced, I'm adding them to the Race & Ship database. Now did you change any statistics for the default races? Otherwise I'm wondering why you had to add the old race files to the mod? Status: offline I'll test it for you as I'm going to see just how many races I can get to work together. I'll post database as soon as I'm done. Status: offline Am I sensing mod with 50 (was that max amount) of unique races in near(ish) future? Status: offline Started a new Campaign anyway and using this mod now :) I like Kalthaniell`s shipsets. Small question here: Can I anyhow define which shipset I want to use for my empire as standard or must I to choose the icon for each design everytime by hand? That way its a bit to much micromanagement for me tho..
You would be changing the mod so the race would forever use that ship set even when the AI use it until you change it back. But when using the race yourself your ships will automatically choose that ship set.